No other dogs or cats!!!! Gertie is a 4 year old female who came into rescue becasue of a job relocation and travel. She is just a sweetheart with people and children, but she DOES NOT like other dogs in her house! She is a very attractive 45 lb fawn girl with white markings and is house trained, lead trained and crate trained. She really prefers to spend most of her day resting while the family is at work, and then loves to go for walks or car rides! She is very good with children and is a very loving and affectionate dog. Gertie is not fond of sharing her house with another dog or cats! She expects to be the only Princess in her castle. So we are looking for a home for her that she would be the only pet. She is great with stairs and loves to race up and down the long staircase. Gertie is very healthy (except for the eyes need gel and drops) and well behaved. 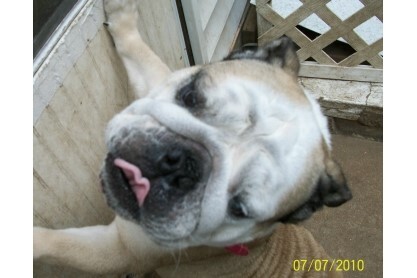 Gertie has limited sight in one eye, and needs to have eye drops and gel applied 2 or 3 times per week. She has not been spayed yet, and will have that done before she is placed. Please have an application on file before contacting us. Vet check, reference check, home check and adoption fee apply. WE DO NOT ADOPT FURTHER THAN 2 HOURS FROM ST. LOUIS!